Are you planning to come to Hurghada to admire the beautiful underwater world of the Red Sea? You can do snorkeling like you always used to do, but you can also experience something new, Scuba Diving! If you have never dived before, you can opt for an introductory dive. Do you want to learn scuba diving? Then you can start the PADI Open Water Diver diving course with our diving school. After earning your scuba diving certification you will be free to dive anywhere in the world along with your dive buddy to a maximum depth of 18 meters! If you already have your scuba diving license, then you are more than welcome to dive with us. It is also possible to do wreck diving or night diving. If you want a new challenge then you can even start an advanced course. 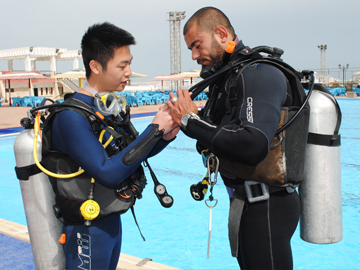 Learn scuba diving in a safe way with our professional diving instructors. You will experience a lot of fun during your dive day. We are serious when we have to be serious, but we certainly love to laugh! Are you looking for a diving adventure? 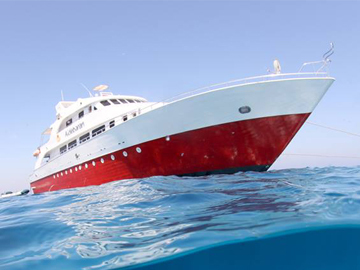 Check out our weekly Red Sea liveaboard safaris dive trips. Had a great dive with Ahmed last friday! Thank you Dive Hurghada for a great introductory dive!! Hope to come back to Egypt soon and start a course with you! Thank you for my best dive ever! Great instructions and guidance under water. Hope to dive with you soon again! Dive Hurghada is definitely the best choice. I recommend that! If you are in Hurghada and you got the chance to dive! Do it by diving school Dive Hurghada! We had a great time with Ahmed! So happy I have my Open Water Dive Certificate. Until next time Dive Hurghada for my Advanced!! This definitively was the best Safari we ever did. at Daedalus we saw a group of at least 20 hammerheads. and dived with dolphins to crown the last day. we could rely on Ahmed for anything! Our professional dive instructor will guide you during your dive while using modern and well maintained dive equipment. We adhere to PADI Safety standards. Don't forget one of the most important things, scuba diving is fun! 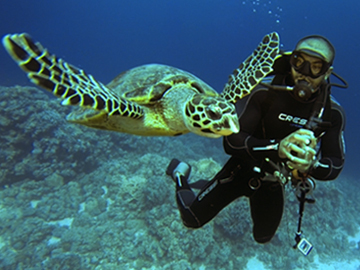 Enjoy the amazing marine life, Use your new GoPro underwater, relax on board and make new friends. Your transfer will be arranged by Dive-Hurghada. The crew will help you with your equipment. The cook prepares international food. Lunch and softdrinks are always included. The captain will bring you to the most amazing divesites. We care about the Red Sea environment. We stand for; looking with our eyes and not with our hands! Do you adore fish and coral as much as we do? Dive with us!